Fathers share a special bond with their daughters. And it’s sometimes hard to express the love found in that bond through words. 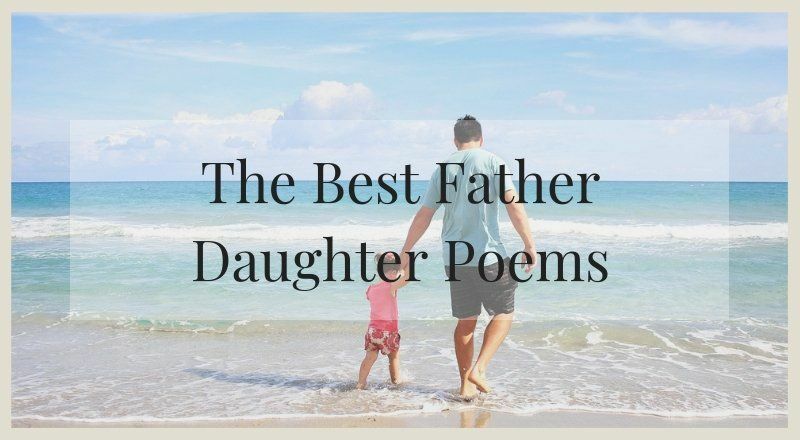 So we’ve set out to make it a little easier for you dads by creating this guide full of father daughter poems that will put a smile on your little girl’s face. Whether it’s during your speech at her wedding or just showing her you care, these poems for your daughter are perfect for expressing your love. As mentioned in the introduction, fathers share special bonds with their daughters unlike any other. Show your daughter what that bond means to you by sharing with her one of the poems below! that no one can debate. that I can only wonder. just makes my heart grow fonder. could ever feel the same. the bond that we retain. and I am yours to keep. This poem is perfect for the father who has raised an independent daughter that is afraid of nothing, eloquently expressing that you will always be there for your beloved adventurer — no matter what life may bring her way. She’s changing so quickly – no longer a child. She wants independence and quotes me her rights. In search of adventure and trying new things. Relies on the guidance of her lucky star. I will be there waiting to welcome her back. Reading this nostalgic poem at your daughter’s birthday, graduation or wedding will guarantee there isn’t a dry eye in the room. If you want to let your daughter know she will always have a special place in your heart as your little girl, no matter how old she may be, this reading will help you express this sentiment in a way she will look back on fondly for years to come. Clothes long out of style. Is powder on the nose. Can’t wash away the time. The way they are today. She’s still my little girl. Want to help out with your daughter’s wedding? Get her the ultimate sparkler send off! Shop our wedding sparklers now! It can be difficult to express the depth of a father’s love, which is why we suggest you let this poem do the job for you. Ideal for a reading or just a sweet note for your daughter before her wedding day, this sentimental poem will remind her of your never-ending love for her as she enters into a new chapter of her life. What could I give you, to show that I care? To open my heart and show what’s in there. Expressing your love for your daughter doesn’t have to be pages upon pages. Sometimes it’s best to keep things short and sweet. Check out these short father daughters poems below! Perfect for a quick toast or a sweet note, this short poem is a cute way to let your daughter know how much she has enriched your life over the years. This could also make a lovely engraving or framed quote for a father daughter birthday gift, graduation gift, or wedding gift with extra special meaning. If you want to let your daughter know how much she brightens your life, this simple poem that is perfect for any occasion should do the trick! No matter what the occasion, this touching poem is a beautiful way to let your daughter know just how proud you are of the person she has become, and how excited you are to see everything she will accomplish in the future. Your daughter will never cease to amaze you. Show her how proud you are of her achievements with these father daughter poems! Take a stroll down memory lane with this nostalgic poem that will show your daughter how much she has meant to you through the many phases of life. Crying because she has just lost a race. Bringing a lifetime of pleasure and pride! Perfect for a graduation, wedding, or any major life milestone, this poem is a special way to express how proud you are of everything that your amazing daughter has accomplished. To find a life of her own. To know that you’re mine. For those who have lost a daughter, our hearts go out to you. They say there is no greater pain than losing a child. These father missing daughter poems will help express how you feel. This tender poem is a beautiful way to reflect on the many happy memories that you were so lucky to enjoy with your daughter. Many times dads can be overlooked when it comes to grieving the loss of a child, which is why this poem is so rich in meaning. Know that you are not alone in your grief and remember the love you have for your daughter through this poem. His heart is broken too when his child dies. Even though his world’s gone wrong. But a piece of his heart has been ripped away too. And his tears come like falling rain. And a world that was once bright, has gone dim. He hides behind a mask when he is feeling down. He struggles and holds in his fears. Men don’t always show how they really feel. We know the last thing you want to do is make your daughter cry, but we promise these father of the bride poems for wedding speeches will bring good tears! Congratulate your daughter and let her know all that she means to you with this celebratory wedding poem. This poem would be perfect for a toast or a quick speech before your father daughter dance. Today’s my daughter’s wedding day. So happy to be his. My first born, love of my life. And just became his wife. She grew up, and loved the boys. To a wedding gown it flowed. She grew up straight and tall. How I loved her through it all. The happiness, and the strife. Surprise your daughter with the most beautiful display of sparklers for her wedding send off. Ideal for a toast or a sweet pre-wedding note, this touching poem is a meaningful way to let your daughter know how much she means to you and how happy you are that she has found her prince charming. To say just how proud I am to call you my daughter. But in my eyes you will always be my little girl. The girl I would try to comfort whenever she didn’t have the best of day. You are the reason I truly believe in unconditional love. The way I did when your mother came into my life. For the man you are about to marry I trust will love you the way my princess deserves to be loved. And I believe you are going to make your husband a very happy man. For I will feel joy, sadness, excitement, and a whole lot more. But, I believe it is now time for you to be a Queen. And rest assured that you could not have picked a better King. Celebrate the fact that your daughter has found love and let her know how much she means to you with this sweet poem filled with loving memories. A new life was given to me by my baby girl. You wooed me with your adoring charms. It was at that moment I knew what true love was. And praising you with many adoring cheers. Walking down the aisle beside the lovely you. Your groom now knows real true love. Just as I have with your mother. Share with us your favorite father daughter poems! Share one of these poems with your daughter and she will love how thoughtful you were. Do you have a favorite poem that isn’t featured here? Miranda is the founder of Bride Envy. She loves everything weddings and especially loves the countless brides she's helped at Bride Envy.